Zakynthos is one of the Ionian islands, one of the most known island complexes in Greece. It is one of the most desirable Greek destinations. Its location in very close to the island Kylini and to the land of Peloponisos, that means that the island is the perfect choice for those tourists who wants to visit different places during their vacation time. Lush landscapes made up of mountains and plains, magical beaches and a number of under the sea caves that seduce the traveler. That natural beauty is the reason that Zakynthos is always Known as the “Flor di Levante”. That phrase means the flower of the east. What are you going to see at Zakynthos? Zakynthos is a place full of surprises. There is a great number of things that you can see or do during your stay on the island. That place is blessed from the muses of the ancient times. You are going to fell in love with the idyllic beaches and the turquoise waters of the Ionian sea. 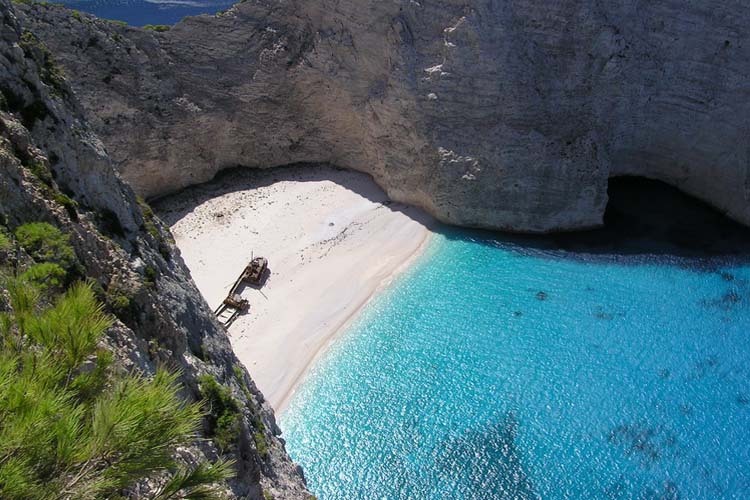 Do not miss the famous beach of Navagio. You are going also have the change to meet the Mediterranean seal Monachus Monachus and swim by that unique creature of the sea, it will be an unforgettable experience. The tourist agency e-globaltravel gives you the opportunity to choose the activities before your travel in order to help you organize your dream vacations. Zakynthos hotels offer you a majority of accommodation choices. The only thing you need to do is to limit those choices by completing the search form with your criteria. What is the available budget; Would you like to stay alone or with your other half or a friend of you? The advanced online booking system that you are going to find on the online platform of our agency is the best way to organize your perfect vacations.